A fruit that is related to the pear and grown in the Mediterranean, the Middle East and the United States. This fruit resembles a lumpy pear without the neck. 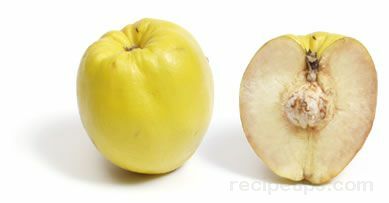 The fruit is yellow when ripe with flesh that is various shades of yellow. When raw, the flesh is acidic, hard and not good for eating, but when cooked, it becomes sweet and delicate, providing a pear and apple flavor. The raw flesh will discolor rapidly when cut, so to preserve the raw fruit, immerse with lemon juice and refrigerate. Quince is great for making marmalades, jams, jellies, and candies. 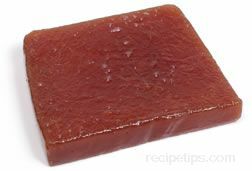 Quince paste or candy, with its fruity flavor, is often eaten with cheese, such as it is in Spain when served with Manchego cheese. Quinces will store well, up to 3 months when refrigerated.